CINCINNATI -- A coroner said Wednesday her office could not determine what led to the fatal brain damage of a young Ohio man detained in North Korea for more than a year. While the parents of 22-year-old Otto Warmbier and President Trump have accused the North Korean government of torturing him, Dr. Lakshmi Sammarco said evidence has led to no "scientific facts" to solve Warmbier's mysterious death. "We don't know what happened to him, and this is the bottom line," she said. A coroner's report dated Sept. 11 shows the cause of death for the University of Virginia student as complications from brain-damaging oxygen deprivation through "an unknown insult more than a year prior to death." The medical term for his condition was called "chronic anoxic/ischemic encephalopathy." The manner of death was listed as "undetermined." While Warmbier's family declined an autopsy, Sammarco said her office used extensive medical scanning and imaging for a "virtual autopsy" and that nothing more would have been gained by doing an autopsy so long after his brain damage occurred. Warmbier's parents told a Fox News TV show Tuesday that North Korea tortured and "destroyed" him. Mr. Trump tweeted afterward: "Otto was tortured beyond belief by North Korea." Mr. Trump's tweet added to a series of recent accusations and heated exchanges between his administration and North Korean officials. 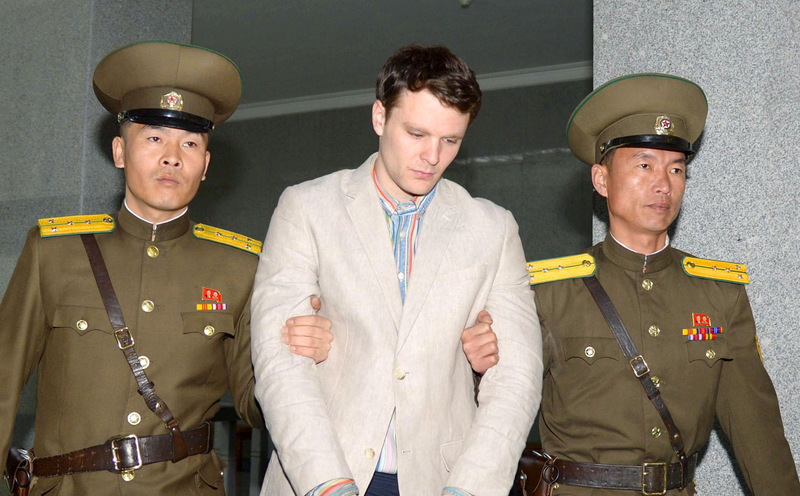 North Korea has denied mistreating Warmbier, sentenced to 15 years of hard labor in March 2016 for allegedly stealing a propaganda poster two months earlier. North Korea has claimed Warmbier fell into a coma that resulted from botulism and a sleeping pill. Sammarco agreed with University of Cincinnati Health system doctors who treated Warmbier and said they found no evidence of botulism or evidence of fractures or healing fractures that might point to beatings. She said a forensic dentist agreed with her conclusion there was "no evidence of trauma" to Warmbier's teeth. Fred Warmbier said on CNN that his son's mouth "looked like someone had taken a pair of pliers and rearranged his bottom teeth." Sammarco said Warmbier's body, including his skin, was in surprisingly good condition for someone who had reportedly been bedridden for more than a year, indicating he received regular care. Her office's report said his body appeared "well-nourished." There were multiple scars and bruises, some apparently stemming from medical procedures. On CNN, Cindy Warmbier noted a scar on her son's foot, saying it appeared to be "an open wound for months and months and months." He died in Cincinnati in June 2017, less than a week after his return to the U.S. Sammarco said Warmbier was put on "comfort care" measures, such as removing a feeding tube. The parents on Tuesday, for the first time, described the condition his family found him in when they went aboard an air ambulance that arrived June 13 in Cincinnati. His father said he was making an "involuntary, inhuman sound," "staring blankly into space jerking violently," and was blind and deaf with his head shaved. UC Health doctors said in June that Warmbier was in a state of "unresponsive wakefulness" and had suffered a "severe neurological injury" of uncertain cause. His father didn't respond immediately Wednesday to requests for comment.